If you have never played Counter-Strike: Global Offensive before, now might be a good time to give the team-based action game a test run. A new Counter-Strike: Global Offensive Free Edition has been released by Valve over the weekend. Available for Windows, Mac or Linux gamers, the edition allows for “offline play against bots and spectating matches through GOTV”. 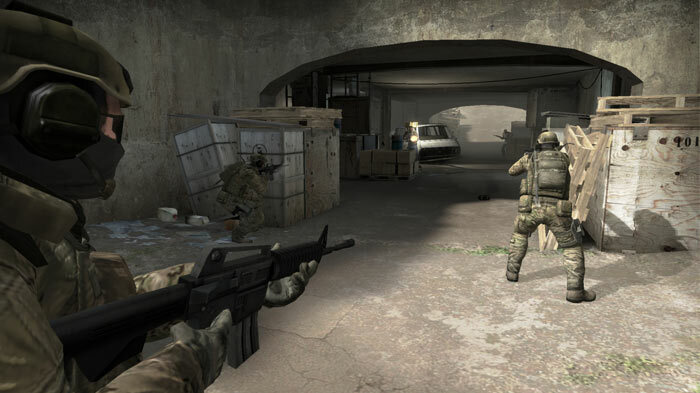 Newbies wanting to try CS:GO but hesitant to splash £11.39/€12.49/$14.99 to dip a toe in this seminal title can now learn the basics of the game and sharpen up their skills playing against the AI (bots), and learn the layouts of the game maps. Further learning opportunities are built-in to CS:GO thanks to GOTV, which used to be known as Source TV, where you can watch competitive matches featuring more experienced players. Valve’s CS:GO contains no classes or special abilities, so the emphasis is on map knowledge and mechanical game playing skill. On the Steam page for the game, shared with the full priced game, Valve explains the reasons for purchasing as follows: “access to online content and features, including multiplayer gameplay, official matchmaking, in-game inventories, skill groups, XP, ranks, and other online features”. The game, launched 14 years ago, was recently updated with tweaks to the UI to better support low-end machines, and the Panorama user interface is the game’s default view. Further tweaks were delivered to weapons (MP5) and maps (Mirage) in this frequently updated title. As well as this freebie and the base game at £11.39/€12.49/$14.99, Valve sells CS:GO in various bundles and it is often on offer during Steam Sales. I'm not sure which version of Counter-Strike you're referring to when you state that it launched 14 years ago. The original game first saw the light of day back in 1999. I started playing in early 2001 (CS 1.2 or 1.3, can't quite recall). Since then we've had CS:Condition Zero, CS:Source and now CS:GO. The latter launched about 5 years ago, if I remember correctly. The author must be referring to CS:S as that was 14 years ago, but counterstrike original was released in 2000, so the series is actually 18 years old. Wait, you mean the Half-Life mod that WAS free, that Valve bought and ruined by introducing Source, and then destroyed and handed straight over to the hackers and scammers by making it CS:GO, is now free once again? Imagine that we came full circle. Valve must have made enough money off of it. I all too fondly remember the days of CS Beta 5.2. Silenced M4, anyone? :D Beta 6 was probably the best release of CS ever. Hopefully this is a sign that we are getting closer to a new release. b5.2 was where I started, them were the days..